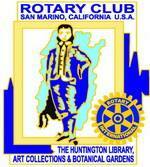 The Rotary Club of San Marino was chartered on April 12, 1939. Our Club has 115 members. We sponsor Interact Clubs at San Marino High School, Huntington Middle School and Southwestern Academy. The City of San Marino is approximately 9 miles east of downtown Los Angeles and is the home of The Huntington Library, Art Collections and Botanical Gardens. Many or our local programs and activities support the San Marino Unified School District.